The Institut für Europäische Politik e.V. (IEP) Berlin together with the Institute for European Policies and Reforms (IPRE) in Chișinău successfully implemented a workshop with Moldovan civil society representatives on anti-corruption multiplier skills and good practices from Latvia. 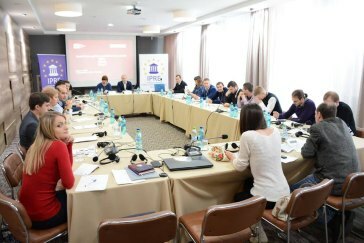 The workshop took place from 2-3 December 2015 in Chișinău and was the third training measure this year as part of the overall programme “Together with Civil Society against Corruption in Moldova”. The programme aims at strengthening the network between civil society organisations in Moldova and at contributing to the revision of the Anti-Corruption Strategy and related institutional reforms. The workshop pursued two aims: firstly, it sought to improve participants’ multiplier skills by transferring how civil society actors in Latvia and the Czech Republic collectively organized their claims in order to shape the development of anti-corruption policies in their respective countries. This included the highlighting of networking and anti-corruption communication skills as well as advocacy strategies. Secondly, the workshop was devoted to the transfer of good AC reform practices from Latvia to the Moldovan context, by examining the successes and failures of the post-socialist transformation country.